In late-2010, Sis. Mary Anne and her employer traveled from Jeddah to London. On December 3 of the same year, a day Sis. Mary Anne is bound never to forget, they left London for Jeddah. According to Sis. Mary Anne’s testimony, they didn’t notice anything amiss while waiting for their plane even when they were boarding. But when they were already airborne, they noticed that there was something wrong with the plane. The passengers began to panic. They removed their seat belts and stood up, not knowing what to do. The children began to wail. There was a commotion as passengers panicked and felt dizzy with the way the plane was flying. Even Sis. Mary Anne became dizzy in her seat beside her employer. But she recited The Lord’s Prayer and Psalm 23 in her mind and she felt her head clear up. The passengers, who were mostly Muslims, were standing up, calling and crying out to Allah. When Sis. Mary Anne felt that the aircraft was already going on a nose dive, she also stood up and with all the strength in her, shouted “Halleluiah! In Jesus’ Name! In Jesus’ Name!” many times. She was crying out and shouting as loud as she could. Almost instantly, the plane stabilized and was able to maintain its altitude. The other passengers were amazed and on an impulse, some of them flocked to where Sis. Mary Anne was standing. They were hugging her tightly, thankful that they were safe. But the other passengers were asking, “Who shouted ‘Halleluiah‘? That’s not allowed with us!” And Sis. 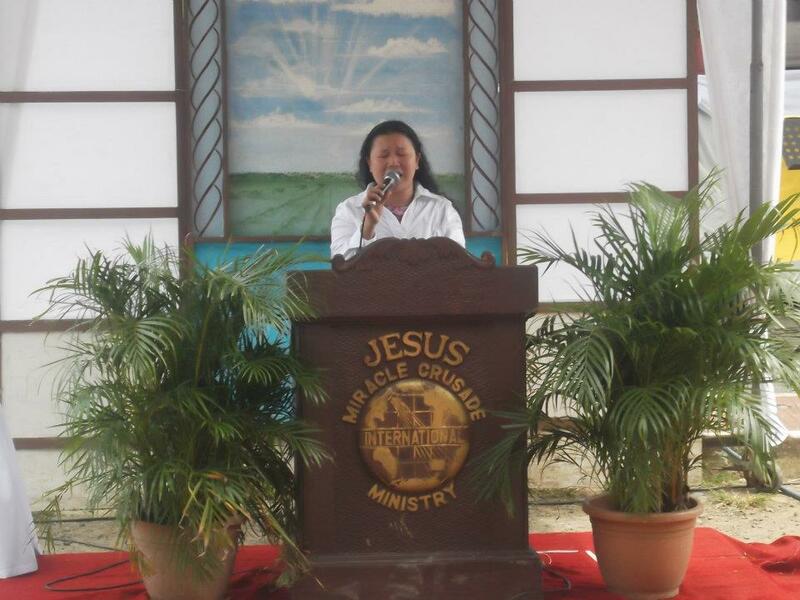 Mary Anne, still empowered by the Holy Spirit, boldly answered, “I belong to the JESUS MIRACLE CRUSADE INTERNATIONAL MINISTRY headed by our beloved Honorable Pastor, Evangelist Wilde Almeda, back there in the Philippines!” She said she really lifted up the name of the Lord Jesus Christ whose power is unequalled and whose mighty deeds are unsurpassed over all the earth. It was then that the captain announced that they were going to have an emergency landing at Qatar airport. But inside the aircraft, the cacophony of children’s cries and passengers talking at the same time continued. When the plane landed at Qatar airport, all the passengers were in a hurry to leave, but it turned out that there were reporters in the plane and they besieged Sis. Mary Anne, wanting to interview her. For Sis. Mary Anne, this was an excellent opportunity to make the name of the Lord Jesus Christ known to all that were present there and give glory to Him. 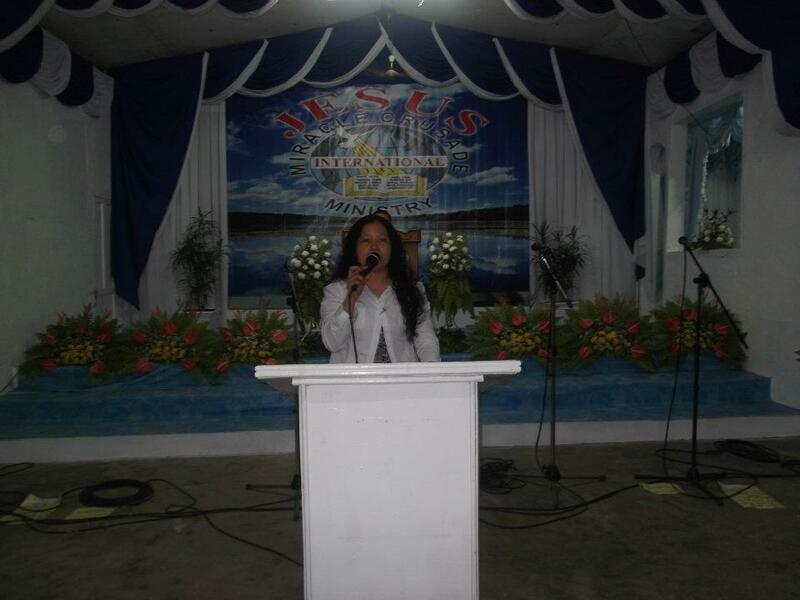 Sis Mary Anne who was of great faith (glory to God!) and who has been serving the Lord in JMCIM for many years, was more than glad to announce to the whole world that the Lord is all-powerful, ever-living God. At this point, the pilot said that in all of his years of flying and piloting an aircraft, this was his first time to experience a near plane crash. And then he testified that when the plane was uncontrollably going down fast, he saw a big hand hold the aircraft and it stabilized. Can we shout Halleluiah? Amen! Halleluiah! (Choking back tears). The God we serve is an almighty God! He never changes! Because of this miracle, Sis. Mary Anne endeared herself to the whole household of her Muslim employer, so much so that they wanted to come visit the Philippines and see the great congregation of the Lord Jesus Christ! (This is not the first miracle that happened in the life of Sis. Mary Anne Bongo. In the late ’90s, the Lord showed her a great miracle which has become a classic major testimony in the Church. By God’s grace, I will write about this in “Miracle in the Life of Sis. Mary Anne Bongo Part 2”). Halleluiah! To God be ALL the glory!